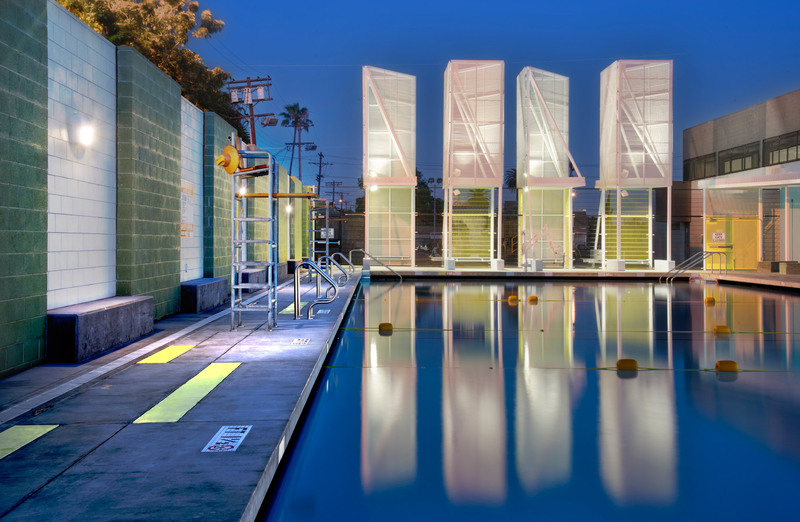 This summer, Lehrer Architects completed work on its latest public park project: the Central Park Recreation Pool in South Los Angeles. Designed to replace an aging aquatics complex, the 1.44-acre project was funded by the City of Los Angeles Department of Recreation and Parks, and is infused with Lehrer Architects’ characteristic do-more-with-less architectural ethos. The project, consisting of a refurbished bathhouse and pool, aims to reactivate a vital community gathering spot in what is one of the most park-poor areas of the city. The bathhouse, a humble structure made of concrete masonry units, is wrapped by a segmented butterfly roof canopy made of tightly folded, corrugated white metal panels. The three roof pitches meet several times over the course of the building’s main entrance on East 22nd Street. At each meeting point, a delicate armature of steel members, including W-beams and square tubing, joins the roof planes. 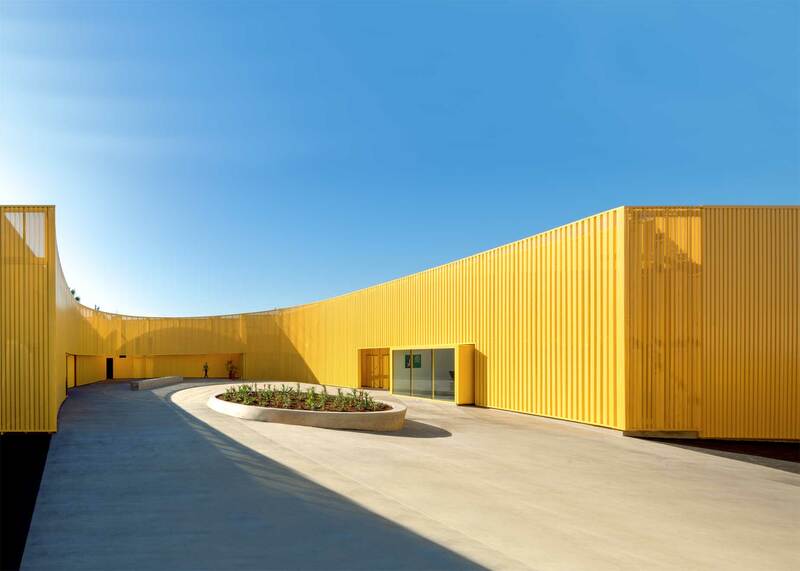 The south-facing exposure, its CMU walls painted bright shades of lemon and lime, gathers and warms the light filtering through the canopies. A longer but similarly articulated form is mirrored about the bathhouse’s central axis, where on the other side it shades the pool deck. At the foot of each of the columns supporting the canopy along this length, the firm has designed broad, monolithic concrete benches. The two benches on either end are cocked a half-turn inwardly, framing the type of communal, yet highly individualized public space that exists far too infrequently in Los Angeles. Buried deeply into the far leg of an L-shaped site is a tetrarch of 20-foot tall towers, each housing a pair of concrete benches. The towers provide a different kind of social space that is simultaneously more intimate and public than the larger shaded area just mentioned. Shaped like parallelograms and wrapped in sheets of white perforated metal, the towers mark the recreation center’s location in the community during the day, reflecting and catching the sun’s light as it passes overhead. 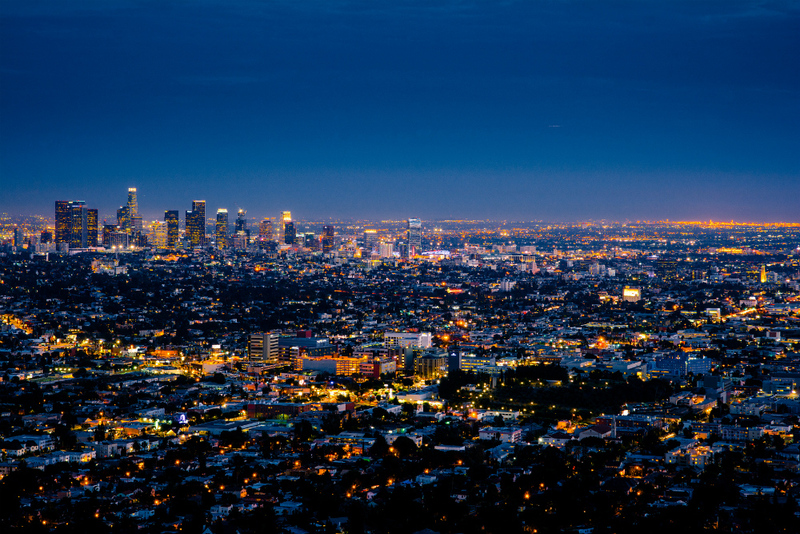 At night, the structures are lit up from within. Are you a cat or dog person? If you're the former, and happen to be an architect or design enthusiast, we pretty much guarantee you will enjoy this post. Do read on. Enjoy. And for those of you who are not cat people, we understand! Dog-lovers, there is always this dog center and world' largest dog park that could come to north Los Angeles. Earlier this month, a cadre of twelve designers displayed their luxe cat shelter creations at a sold-out fundraiser in Los Angeles. Architects for Animals hosted the event to help raise money for FixNation, a nonprofit that neuters and spays homeless cats. 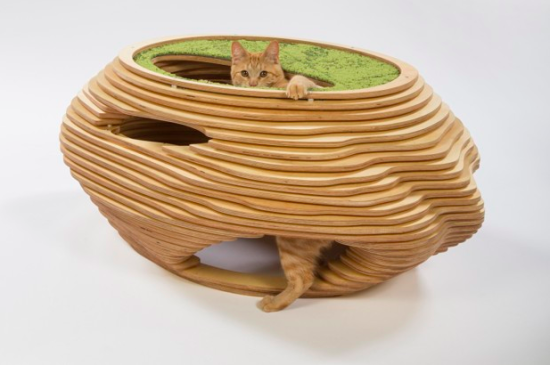 There was something for every cat and design lover, including a spaceship-inspired shelter and a modernist “Catcube” with movable louvers for temperature control. And then there was the organic form of Abramson Teiger Architects' shelter and the whimsical, almost Dada-inspired design by Lehrer Architects. Not a fan of contemporary design? The free-admission Feline History Museum in Alliance, Ohio, holds a Cherokee Red custom cat house reportedly designed by Frank Lloyd Wright’s office in the 1950s. The cat home was originally created for car dealer Gerald Tonkens' daughter, Nancy, who had a cat named Felinus. Tonkens wanted the cat house to complement the family's Frank Lloyd Wright Usonian Automatic home. At one point Tom Monaghan, founder of Dominos Pizza, owned the cat house before it eventually made its way to the museum. And then, for fun: there is a traveling Internet Cat Video Festival, hosted by the Walker Art Center featuring curated cat clips, now touring 20 international cities from Gifu, Japan, to Melbourne, Australia, to Oklahoma City, Oklahoma. The festival started early January and will run through the first week of August. 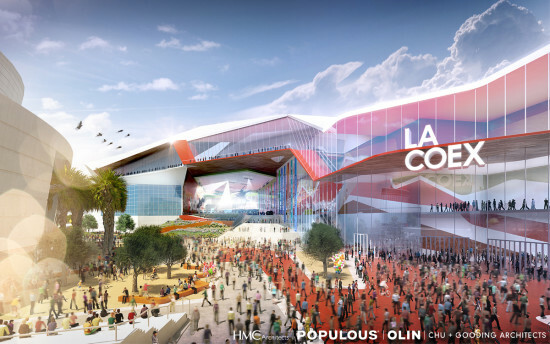 Despite the recent opening of LA County’s Grand Park, County Supervisor Gloria Molina generally seems to have it in for contemporary design. 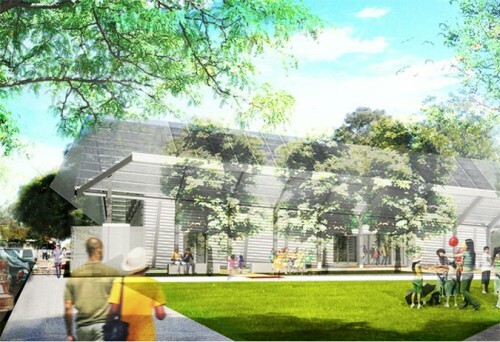 Add to her list of architect victims Lehrer Architects, whose striking San Angelo Community Center north of Los Angeles was set to move forward, receiving community reviews and preliminary local sign off. In stepped Molina, who apparently didn’t like the modern look of the project. She killed it immediately. Now that’s power.